Magellan's management is capitalizing on all the cash coming in the door and the investment opportunities in oil and gas transportation. 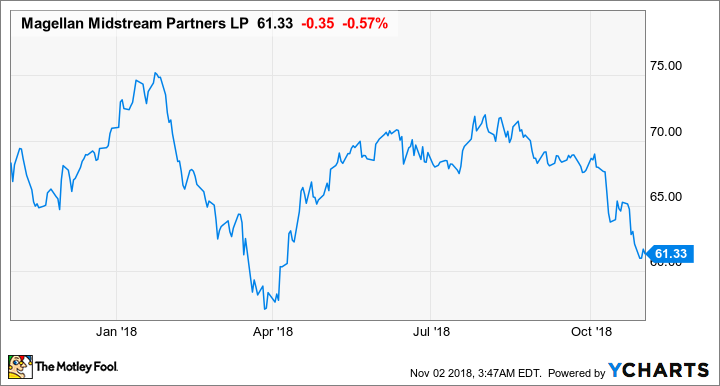 Thanks to so many oil and gas customers clamoring for space in an oil pipeline, Magellan Midstream Partners (NYSE:MMP) continues to generate gobs of cash. The company's results were good enough this quarter that management felt confident enough to raise guidance for the full year again. Investors shouldn't expect that guidance raise to translate to faster payout growth, though, as management has big spending plans in the coming years. Here's a look at Magellan's most recent results and what management has in store for the next couple of years. DATA SOURCE: MAGELLAN MIDSTREAM PARTNERS EARNINGS RELEASE. EPS = EARNINGS PER SHARE. Magellan's large increase in earnings per share looks remarkably out of character for a business that tends to deliver incremental gains quarter in, quarter out. The reason for the unusual result was a one-time gain from the sale of a portion of its BridgeTex pipeline to OMERS, which is the Ottawa municipal employee pension fund manager. The master limited partnership sold about a 20% stake in its interest in the pipe and realized a one-time gain of $354 million, or $1.55 per share. Magellan did say the benefits of the sale were not included in its distributable cash flow or adjusted EBITDA for the quarter, which were very much in line with what we have seen from the company. Management attributed the increases in cash flow from a few new assets commencing operations and high tariff rates for any available space on its long-haul pipelines from the Permian Basin to the Houston area. Those results were so good that management raised full-year distributable cash flow guidance to $1.12 billion and its distribution coverage ratio for the year will be better than 1.25. Data source: Magellan Midstream Partners. Chart by author. Magellan announced that it is conducting an open-season bidding process for potential customers on its proposed Permian to Gulf Coast pipeline. The 600-mile pipe will be co-developed by Magellan, Energy Transfer, MPLX LP, and Delek US Holdings and will transport crude oil from the Permian to Magellan's Houston distribution system and Energy Transfer's Nederland Terminal. The final capacity of the pipe has not been announced because the consortium is awaiting total interest from the open season, but Magellan already estimates it will move about 1 million barrels per day and Magellan's share of the cost will be around $500 million. While this was the only major project announced this quarter, Magellan's management said in its earnings press release that it is working on several new projects not currently in the budget. Those projects include another crude oil pipeline from Cushing, Oklahoma, to the Houston area, a pipe from Houston to Corpus Christi, Texas, and a crude oil export terminal in Corpus able to load Very Large Crude Carriers. Management completed a recontracting of its Longhorn crude pipeline in the quarter and was able to contract the entire capacity of the pipe. The average contract length is now five years, which will give a lot of revenue visibility for management. On the conference call, CEO Michael Mears discussed the company's recently increased guidance for the year and some more detail on its spending plans thus far for now through 2020. As you can see, Magellan continues to generate solid financial results and our business fundamentals remain extremely strong. Based on our solid results so far and our expectations for the remainder of the year we have increased our annual DCF guidance by another $20 million to $1.12 billion for 2018. We remain committed to our stated goal of increasing annual cash distributions by approximately 8% for 2018 and by 5% to 8% for both 2019 and 2020 while maintaining distribution coverage of least 1.2 times. Moving to expansion capital, we now have a record $2.5 billion of construction projects currently underway , including our share of the PTC pipeline that we discussed earlier. Based on the progress of these projects we now expect to spend approximately $800 million in 2018, $1.3 billion in 2019 and $400 million in 2020 to complete the current slate of construction projects. While spending can shift slightly between periods, we are pleased that our largest projects are on time and within budget. You can read a full transcript of Magellan Midstream Partners conference call here on fool.com. Even though management continues to raise its guidance for distributable cash flow for the year, management continues to keep its payout growth at a much slower rate than its historical average. This isn't a sign that the company is struggling, though. On the contrary, it's keeping payout growth muted so it can retain more cash and fund all of these new capital projects. 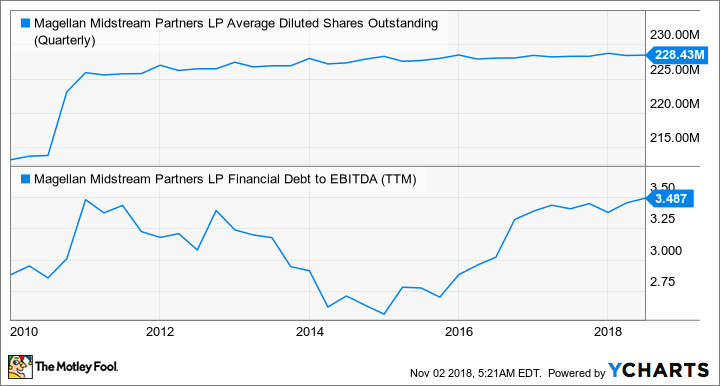 One thing that Magellan's management has done exceptionally well over the years is fund growth without having to issue new shares or increase its debt load. The proposed projects Magellan has in the hopper are probably going to be large capital projects, so investors shouldn't be surprised if these high rates of capital spending continue past 2020. Once these assets get built, however, they should deliver considerable amounts of cash that will help fuel payout growth for years into the future.